Address: 391072 Ryazanskaya obl., Spassky r-n, p/o Lakash, pos. Brykyn Bor. 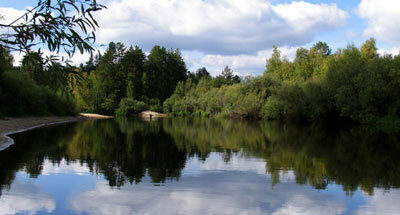 Zapovednik Oksky, in the northern part of Ryazan Region, was established in 1935. The Zapovednik boundaries varied in a wide range; today its area is 55,7 thousand ha, the area of biosphere section is 32,8 thousand ha. The Zapovednik is situated in the south-eastern part of the Meshcherskaya Lowland in the basin of the middle reaches of the Oka River; its southern boundary is formed by the Pra River, the Oka left tributary. In spring, considerable areas are inundated — the floodplain and terraces above floodplain of the rivers Oka and Pra, and mire massifs in the center of the Zapovednik; only its north-western part with outwash plain nature complexes is not flooded. In the landscapes nature complexes prevail that are characteristic for "polesya" dominate — pine forests on sand soils with dune relief features; and eutrophic fens in depressions. The zonal type of communities is coniferous-broad-leaved forests occur patchily in the central and western parts of the Zapovednik. The frequent and usually sharp change of nature complexes, characteristic for entire Meshchera, results from the geomorphologic characteristics of the site. Developing on the tops of sand hills are sparse lichen pine forests; slopes are occupied by green moss pine forests, those with bilberry, shorthear and forbs. 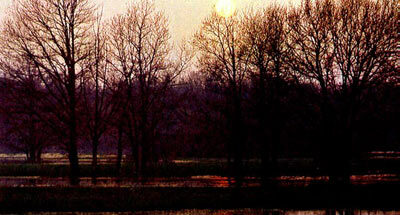 In the lowlands birch forests grow; they develop also at the site of pine forests destroyed by fires and old fellings. 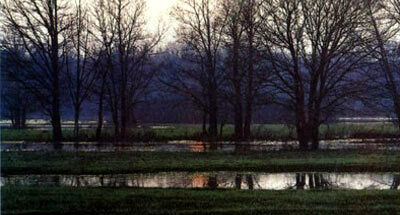 Communities of alder forests occur in the floodplains of small rivers. In the valley of the Oka River from the low floodplain towards high terraces meadows, willow forests, and oak forests are consecutively replaced by one another. The flora has been well studied –over 800 species of vascular plants have been studied. For the first time for Middle Russia Eleocharis austriaca and Alisma bjoerkqvistii and other species have been found, and a new species described — Trapa metschorica. The caltrop is listed in the Red Data Book of the Russian Federation. 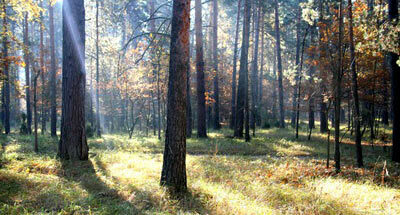 The wildlife is characteristic of the central European Russia. The ungulate species of the Zapovednik is the moose; among the predators are the fox, wolf badger, marten, ermine, least weasel. The beaver population has been restored. The desman, Russian endemic, is common — the Zapovednik was established to protect this species. There are numerous birds of prey. In addition to the common birds as the goshawk; sparrow hawk, common buzzard, black kite, honey buzzard and spotted eagle, some rare birds nest within its boundaries as the osprey, short-toed eagle, saker falcon, white-tailed eagle At sites hard of access, the black stork, a rare species, finds its habitat. Waterbirds are abundant, mostly numerous during spring and fall migration. The southern edge of the capercaillie distribution range passes through the Zapovednik. The Oksky Zapovednik has a biosphere status; in 1990 a biosphere zone with an area 32,8 thousand ha was attached to it with the purpose of conducting experiments on the productivity of biocenoses of south-eastern Meshchera for monitoring, etc. The Zapovednik has a certificate of the European Council.